Home / What Are the Key Parts of a Filter Press Used in Liquid/Solid Separation? What Are the Key Parts of a Filter Press Used in Liquid/Solid Separation? In a prior blog post, we answered the question, “What Is a filter press and how does it work?” In this post, we describe what the key components are in a filter press. To recap, a filter press is a piece of equipment – a machine – that is used for liquid/solid separation. The liquid to be filtered is the suspension or slurry. When the slurry is pumped under pressure through a filter press, the liquid passed by the filter is called the filtrate. The solids retained within the chambers are known as the “filter cakes.” Clients frequently rely upon Micronics’ expertise to assist with achieving drier filter cake solids, a key tool for reducing expenses for transporting filter cake. You can view a recent blog post on this topic here. The Press Frame (also known as the Skeleton). There are various frame types that we manufacture and these include “side bar” filters and “overhead beam” filter presses including both single-beam and twin-overhead beam. The Filter Plates, Pack or Plate Stack – consisting of Head Plate, Intermediate Plates, and End Plate. Components for Closing, Clamping & Opening the Plates – consisting of hydraulic cylinders & power packs. Hydraulic cylinders can be powered manually, air-assisted, or can be electrically-driven. The slurry type may dictate the type of power pack needed and Micronics will assist you in determining the optimal power pack for your application. The Filter Cloth – great, high-quality cloth is critical to excellent filter press performance. 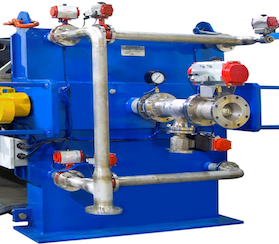 When it comes to selecting the ideal filter press for your application, Micronics will walk you through all the aspects from frame design to plate and cloth selection, manifold specifications, and hydraulics. We will work with you to achieve the right design for your unique application. Yes, we do have a robust Stock Press Program which is great for speedy delivery if the press specs meet your requirements. But we also specialize in custom filter press designs with all the options from automatic cloth washing to bomb bay drip trays to cake blow to stainless steel piping; it is all about what is required for your process. At Micronics, it makes sense that “engineered filtration” is in our name. Micronics is an expert in all things related to liquid/solid separation and pressure filtration. You can count on Micronics as a top filter press manufacturer and a top filter cloth manufacturer. In fact, our customers tell us they truly value our combined filter media and filtration equipment expertise. Contact us so Micronics can help you with your next filter press project. This heavy-duty 1500 mm Filter Press model employs a side-bar frame. Here the filter press plates are suspended by the plate handles which are resting on the sidebars. This CGR plate stack is shown on an air-over-oil filter press with pneumatic shifter. Micronics offers a host of plate stack options including membrane squeeze plates and mixed packs, depending on your specific application needs. We have a number of options including electro-hydraulic filter presses with automatic hydraulically-driven shifter systems. Pictured here is an air-over-oil power pack. In this instance, hydraulic cylinders use an air-operated intensifier pump to build hydraulic pressure for closing and clamping the filter press. Air is directed to the opposite end of the cylinder for opening the filter press.